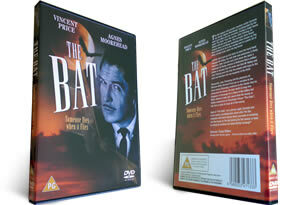 'The Bat' with Vincent Price and Agnes Moorehead on dvd. Delivered FREE in the UK with Super Saver Delivery. A strange and horrific mutilating killer is believed to be in the vicinity of a house rented by murder mystery writer Cornilia van Gorder. Every one else leaves in fear, apart from the maid Lizzie, the rest has you in fear in this classic horror.